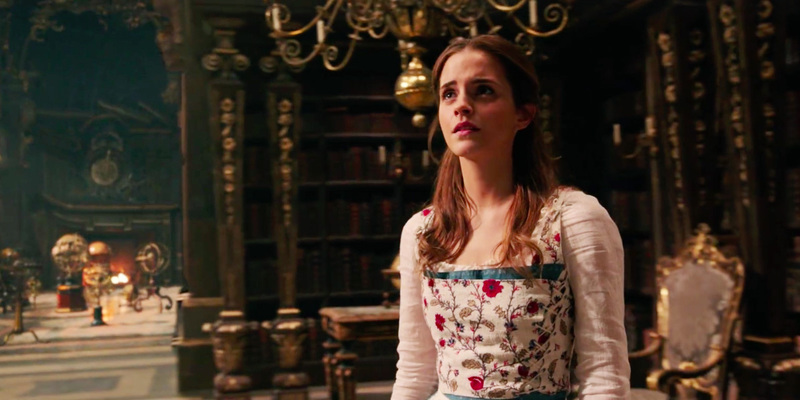 When Belle is your favorite princess and Beauty and the Beast ranks among your top three Disney animated films of all time, you have to be excited about the new live-action remake. I certainly was—nearly about to burst in anticipation, in fact. This film was stunning in a visual, musical, and historical sense, all of which struck me on my first trip to the movie theatre. It was perfectly respectful of the original, while incorporating several new elements that added something new to the story. There’s only one complaint I had about the film as a whole, and that’s a minor distraction compared with such a fantastic achievement. All of these were actual comments said to me in the past couple of weeks in anticipation of the new Beauty and the Beast—and all I could do was try to reign in my excitement. I had tears in my eyes every time the trailer came onto the movie screen. That piano melody playing over the “Disney” castle got me every single time. I watched every interview I could find online about the cast and behind-the-scenes filming. I put on my blue dress and white blouse, styled my hair into Emma’s Belle ponytail (shout-out to Cute Girls Hairstyles for always having my back), and headed to the theatre full of excitement. When the theatre lights dimmed, I got goosebumps. The Castle was absolutely and utterly stunning. Every square inch of it reminded me of Versailles—from the gold-leaf decorations on the walls to the architecture of the front courtyard. The meshing of the hall of mirrors and the ballroom was stunning. There were even ceramic heaters in the corners of the rooms! The Music paid due homage to the original. As it should, considering the involvement of original composer Alan Menken. I loved hearing snippets of the original melodies entering at new points throughout the story. The vocals were well done, with no complaints. Of course Emma Watson is no Paige O’Hara, but she did fine, especially in moments where she sang out more. Audra’s addition to the film was beautiful, historical, and tasteful. The Likeness To The Original was a bit of a surprise to me. And, dare I say, was my main complaint (if I were to choose one). For the most part, the film proceeded exactly the same as the animated movie that I’ve watched 500 bazillion times—which, surprisingly, somehow, made it feel long. We all left the theatre yawning, and not energized. The pacing of the original movie was so beautifully done, but somehow this one lacked the excitement. I think the screenplay could have been just a little bit more risky with adding a new take on the story. With a 70% rating by critics and an 86% rating by audiences on Rotten Tomatoes, I’d say my rankings are a bit higher than most. “Overlong,” “campy,” and “overly-rendered” are a few words used by critics on the site who opposed the film, but I’d say perhaps the only one that I agree with is the first. In all honesty, though I loved the film immensely, I’d have to say that I enjoyed the trailer more. I actually cried while watching the trailer, but the full movie didn’t exact the same level of emotion from me. I’m not saying that Beauty and the Beast didn’t live up to its trailer—but I am saying that the pacing of the trailer may have been more exciting and engaging than the actual film as a whole. All in all, this was a strikingly beautiful film that was a beautiful tribute to an original classic. I am so glad Disney is continuing in this vein and breathing new life into the tales we grew up with. What were your favorite moments of the film? Who was your favorite casting pick for the live action version? Do you wish Disney had done anything differently this time around? I’d love to start a conversation with you in the comments below.